Many of us have wished for flatter stomachs, a goal that seems more frustrating and elusive the older we get. You might have been tempted by infomercials for exercise devices or breathless magazine articles promising "flat abs" and tighter tummies "in just days." Despite the hype, spot exercising abdominal muscles won't get rid of fat. The only way to do that is to expend more calories than you take in. Working these muscles has its place, but the smart money these days is on strengthening a variety of trunk muscles, collectively known as "the core." Core conditioning improves posture, which contributes to a trimmer appearance (poor posture can give even a woman with well-toned abs a little "pot"). Moreover, developing core muscle strength can boost the effectiveness of workouts and reduce the risk of injuries that sideline our efforts to stay in shape. If you've ever had physical therapy to treat low back pain, you're probably familiar with the concept of strengthening the core — the muscles in the abdomen, lower back, and pelvis that lie roughly between the rib cage and the hips. The strength and coordination of these muscles is important not only for sports and fitness routines but also for daily life — for example, reaching up to a shelf, lifting a child, or sponging a spot off the floor. The current drive behind core conditioning comes in part from studies conducted in the 1990s showing that before they move an arm or leg, people with healthy backs (in contrast with those suffering from low back pain) automatically contract their core muscles, especially the transverse abdominal muscles, which wrap from the sides of the lower back around to the front. Experts concluded that well-coordinated core muscle use stabilizes the spine and helps create a firm base of support for virtually all movement. 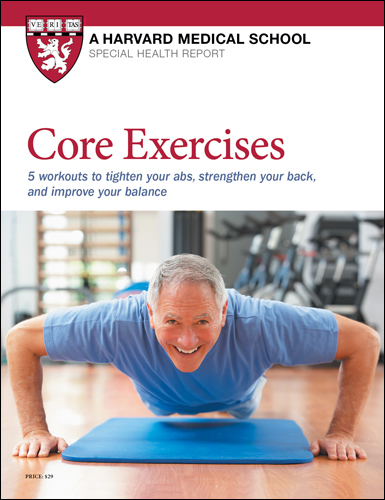 The role of the core is also central to the Pilates method, a series of exercises developed during World War I to help rehabilitate soldiers returning from the war. Its founder, Joseph Pilates, referred to the core as the "powerhouse." These days, patients who are receiving physical therapy for chronic low back pain or injury are told to contract their core muscles before performing prescribed exercises. And Pilates exercises are increasingly incorporated into health club workouts, along with other approaches that engage the core, such as fitness (stability) balls, yoga, and tai chi. Exercises that strengthen abdominal and other core muscles should be part of an overall fitness plan that includes regular moderate-intensity aerobic exercise, such as brisk walking, 30 minutes per day, most days of the week. Guidelines also encourage us to get 20 to 30 minutes of strength training two to three times a week, and that might be a good time to fit in a few exercises designed to work the core. You'll probably start by learning how to "draw in" — the first step in performing all core exercises and a basic tool you can use in almost any physical activity you perform (including walking). Here's what you do: Sitting, standing, or lying on your back, gently but firmly tighten the abdominal muscles, drawing the navel in toward the small of the back. The tailbone should be slightly tucked. (Some trainers prefer to call it "bracing" the muscles, as if you were preparing to take a punch in the stomach.) Practice holding this position for 10 seconds at a time while breathing normally (that's the hard part!). Once you get the hang of drawing in, you can start doing some core exercises, progressing from those you do on a stable surface (the floor or a mat) to those performed on an unstable surface, like a stability ball. Below are just a few exercises that can help strengthen core muscles. If you decide to try any of them, go slowly, work at your own pace, and don't keep doing anything that causes pain. Concentrate on performing the exercises correctly, not on the number of repetitions or how quickly you can do them. And don't forget to breathe! Lie with your back pressed to the ground, your hands at your sides, your knees bent, and your feet off the floor (ankles crossed) so that your knees create a 90-degree angle. Tighten your abdominal muscles, and raise your hips toward your rib cage, curling your tailbone off the floor (see illustration). Hold for a second or two; then slowly lower your hips to the starting position. Work up to 12 to 16 repetitions. Note: Use your hands at first to help stabilize yourself, but rely on them less as you get stronger. Lie on your stomach with your arms above your head. Tighten your stomach muscles; then lift your right arm and left leg (see illustration). Hold for five seconds. Lower, and rest a moment; then repeat with the left arm and right leg. Work toward eight to 12 repetitions on each side. Note: Avoid arching your back (keep your abdominal muscles engaged and your pelvis tucked). When you're ready for more, try lifting the leg and arm on the same side. Lie flat on the floor on your back. Place your fingertips at the back of your head. Tighten your abdominal muscles, bring your knees up to a 45-degree angle, and lift your shoulder blades off the ground. Turn your upper body to the left, bringing the right elbow toward the left knee and extending your right leg (see illustration). Switch sides, bringing the left elbow toward the right knee. Continue this pedaling motion, slowly, for a total of 12 to 16 repetitions. Rest and repeat. Note: Avoid pulling on the neck.